A variety of small grains are grown in the northeast for both human and animal consumption. Unfortunately, there is often a lack of infrastructure in place for processing these grains into a finished product. However, as consumer demand grows and more farmers begin growing grains for human consumption, the opportunities for on-farm or commercial processing increase as well. Some grains require a higher level of processing due to the hulls not being removed from the grain during harvest or high oil content. 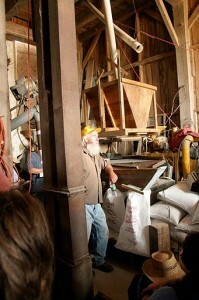 The grains rye, wheat, corn, peas, and beans require minimal processing, usually only cooking and/or simple milling. Oats, buckwheat, spelt and barley, on the other hand, need to be de-hulled with equipment not commonly found in the northeast. Oats, because of their high oil content, should be steamed to increase their shelf life and decrease their chances of becoming rancid. In this section we will discuss the grains grown in the Northeast and how to properly process them, but you will also find more information on specific grain crops in Our Northern Grains. At right, Jack Lazor demonstrates some of his processing equipment at a Butterworks Farm and UVM Extension Field Day in 2010. Here he stands in front of a gravity table, which shakes back and forth and moves plump, high-quality kernels to one side and smaller, lighter kernels to the other. Gravity tables help growers grade their grains before further processing. Many innovative growers have come up with ways to process their grains on their own. These do-it-yourself threshers and winnowers are especially useful on a small, homestead or small-community scale. If you’re curious about building your own appropriate-scale grain equipment, check out these designs from the Permaculture Institute for a farm-scale winnower and a hand-operated winnower. Many of the imaginable designs for grains-processing equipment can be created with simple, inexpensive materials. 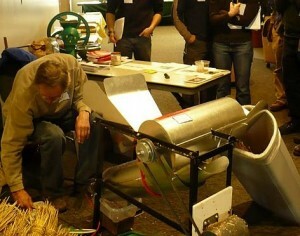 To the left is John Howe’s design for a small-scale thresher/winnower, as seen at the 2011 NGGA Conference. Click here for information from ATTRA on adding value to your grain products by processing them yourself.